The Brouwerij de Koningshoeven at the Abbey of Our Lady of Koningshoeven in the Netherlands is the only remaining Trappist brewery outside of Belgium. Interestingly the brewery is located only about 8 miles from the Belgian border. Monks arrived on this site at Tilburg in 1881 and they have been brewing since 1884. In 1999 the brewery entered into an agreement with a commercial brewery and lost the right to use the Authentic Trappist Product logo, although the brewing of Trappist style beers never ceased. The privilege to use the "Authentic" logo was reinstated in 2005. In many markets the beers are branded as La Trappe, however in the United States they are marketed under the Koningshoeven name. We resumed our Trappist beer exploration with Koningshoeven Tripel. The bottling code stamped on the label was hard to make out. It appears to read "K04J4" on one line, followed by a blurred "10:94" on the second. I initially wondered if we'd be enjoying this beer with our meal as we were presented with a very stubborn cork. I can't recall having as much difficulty with a corked and caged bottle as I had with this one. Perseverance paid off and we were greeted by a attractive glass of marmalade-orange color with a thick, frothy off-white head. The head dropped fairly soon leaving lots of lacing. The aroma of the Koningshoeven was a sweet fruitiness with yeast and mild pepper in the background. The flavor has fruit at the forefront; oranges and apples, and not overly sweet. Hop bitterness is restrained. There's a very nice malt balance to the flavor with a slight pepper note added in the aftertaste. The 8% ABV was very well-masked in this Belgian triple. Mouthfeel is moderately thick and creamy. There's just the right amount of refreshing carbonation. Dinner this evening was a Thai dish of Chicken Peanut Satay. The dish was light in flavor but not overwhelmed by the well-balanced beer. For dessert, a simple Hershey chocolate bar provided a fitting finish. 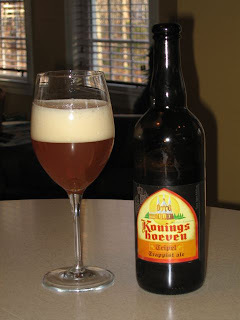 Colleen and I both enjoyed this Koningshoeven Tripel very much. Thankfully, it was well worth the effort it took to open the bottle. I have no idea why, but I've always had trouble getting the Koningshoeven bottles open.